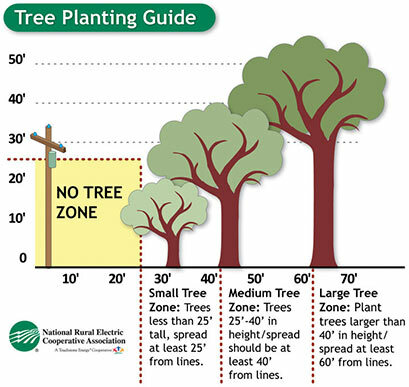 Trees growing near RECC electric lines occasionally need to be pruned or sometimes cut down in order to minimize outages and to maintain reliable, safe electricity at a low cost. Tree trimming is a free service that may or may not be required on your property. If you request the removal of a tree that could endanger Rural Electric lines, the tree will be taken down and cut up for your use or disposal. In clearing the right-of-way for our electric lines, trees will be cut up and brush and wood will be piled separately. If tree pruning is required, tree branches will be chipped and the larger wood will be cut up and left for your use or disposal. If you notice a dead or dying tree near power lines, a tree with branches growing very close to or touching power lines, please contact us immediately and do not attempt to remove the tree branch(es) yourself. Please note that we do not remove stumps nor do we remove the tree debris after it is taken down; We only work with vegetation that compromises the safety of our lines. All tree pruning is done in accordance with American National Standards Institute recommendations (A 300, part 11-2001). Please contact RECC’s Operations Department at 217-438-6197 or e-mail us at recc@recc.coop for more information. RECC crews need safe access to the box for routine maintenance and to restore power during outages. Please maintain a safe zone by keeping any fencing, landscaping, or other obstructions at least 10 feet from the front and 3 feet on the sides and back of the transformer. This will ensure proper air circulation and prevent landscaping from getting damaged by our equipment. And because of underground high-voltage wiring leading to the box, always call JULIE at 8-1-1 before digging around a pad-mounted transformer.